There are a number of great restaurants in the King West neighbourhood, one new restaurant is Wvrst located just west of King and Portland. 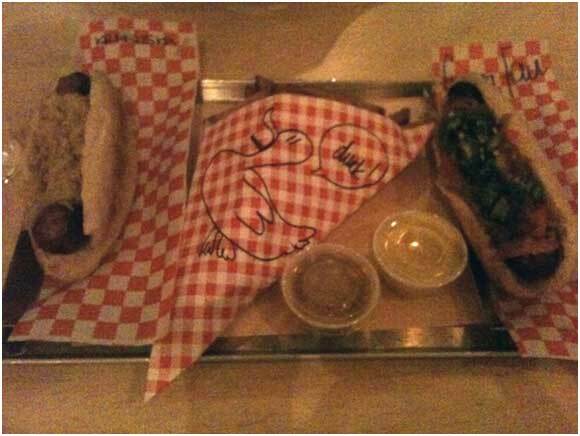 I decided to try Wvrst one evening to see what all the hype was about. When you walk into the restaurant you notice large wooden tables and benches in the centre of the space and the kitchen and bar are located along the walls. The concept of the restaurant is pretty causal, we were handed a menu when we walked in, you can choose from various types of sausages in the display window or order one off the menu. After you order they encourage you to find your own seat where they will bring your food and drinks straight to your table. 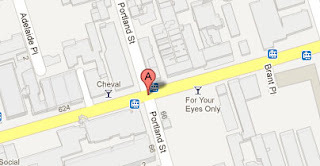 To get to the Portland and King Hub, take the King Streetcar west from King or St. Andrew Station, or take the Spadina or Bathurst Street cars south to King Street, and walk over to Portland. The menu features traditional sausages from different countries, vegetarian, poultry and game meat sausages. You can order your meat two different ways: currywvrst, served sliced with tomato curry sauce and bread or sausage served in a fresh bun. I decided to go with game meat, a guinea fowl sausage in a bun. The actual guinea fowl meat is combined with old cheddar and asparagus bits. 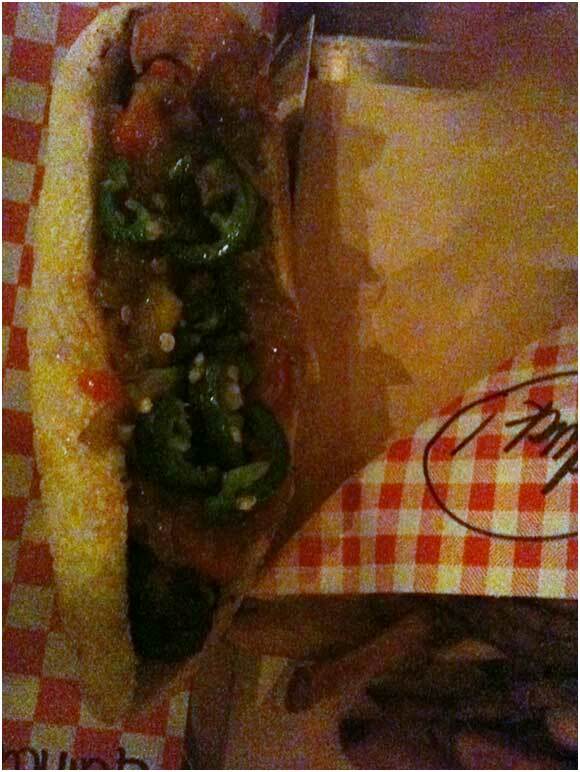 You have the option of adding two complimentary toppings to you sausage, upon the advice of the cashier; I topped off my sausage with caramelized onions, sweet peppers and sautéed jalapeños. I couldn't resist ordering a side of duck fat fries, which also came with a complimentary dipping sauce. I ordered a large side to share with a friend and opted for two sauces, curry and maple rosemary. The guinea fowl sausage turned out to be very lean and extremely flavourful the cheddar flavour immediately came through followed by hints of spices. The meat itself was not nearly as gamey as I had anticipated. As I continued to chew on my sausage I started to regret my topping decision, the sautéed jalapeños proved to have an overbearing amount of heat. 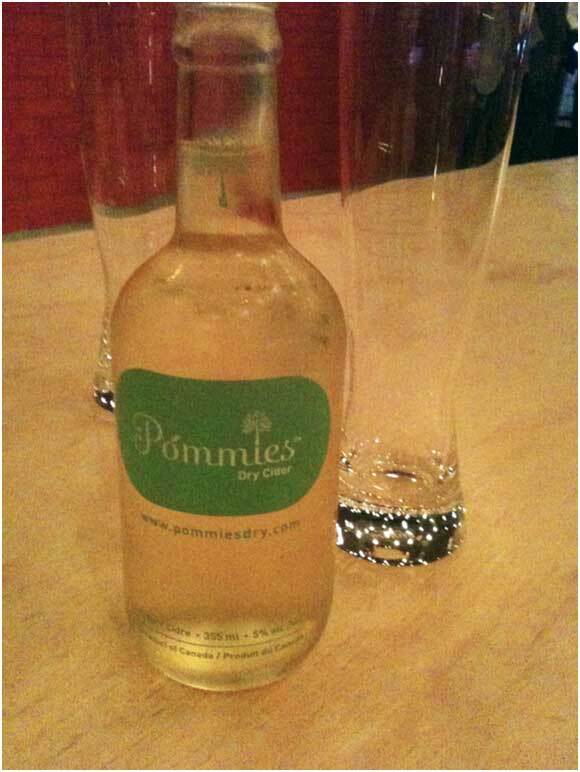 I was lucky enough to have a beer on hand, a gluten free local apple cider. The sweetness of the beer balanced out the heat of the peppers perfectly. The fries were just the right cut, not too thick or thin and not overly oily, surprising considering they were fried in duck fat! 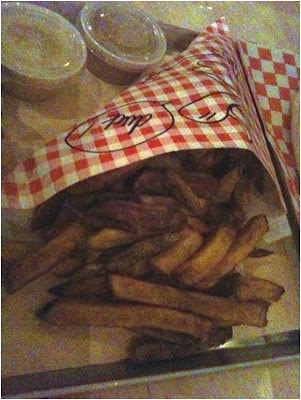 The duck fat coated the fries with a nice aroma; the fries were rich and indulgent, soft on the inside while staying crispy on the outside. My favourite of the two dipping sauces was the curry, thick with a hint of heat. The maple rosemary dipping sauce was pleasant but had a watery consistency compared to the curry. The cider’s smooth texture and sweet finish was an excellent compliment to the entire meal. The only minor drawback was the sausage bun, I found it a tad bit soggy from the mounds of toppings, but I didn't seem to mind it too much as I was able to finish the entire thing. Price wise, the meal was about average, a bit pricier than I anticipated for the type of food. The sausages are $6 - $9, large duck fat fries will run about $6.50 and alcoholic drinks are standard prices, from a $6 beer to $12 for a glass of wine. Because I went to Wvrst for dinner, I didn’t mind paying a bit extra for my meal. Wvrst sells some pretty unique types of sausages, game meats are often associated with fine dining restaurants. However, by introducing game through a common street food, Wvrst demystifies this meat and makes it more accessible to the downtown Toronto crowd. 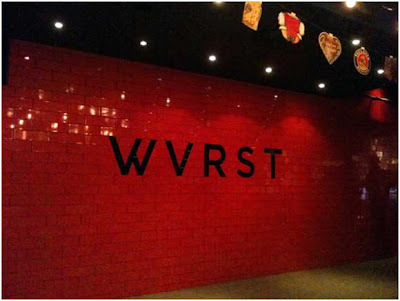 Wvrst’s relaxing atmosphere and great food makes for the perfect after work environment with friends or co-workers. Nhi Tran... congratulations on an excellent start ! I'll be sure to check out this place the next time I need a veggie sausage fix .... with an order of the yummy fries with the curry dipping sauce.. mmmm.. my mouth is watering ! Thanks Kuntal! I hope you enjoy the food at Wvrst.